And it will provide up to 160 terabits per second of bandwidth, which is 16 million times that of your home Internet connection. Two of the internet’s biggest behemoths are partnering to build their own underwater cable across the Atlantic Ocean, connecting the US to Europe. Facebook and Microsoft have appointed Spanish internet carrier Telefonica to build the cable, and its new infrastructure company, Telxius, to manage the high-speed link afterwards. 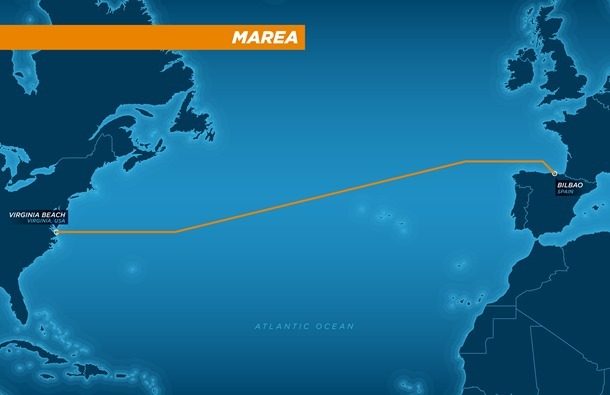 MAREA, as the cable is called, will stretch 4,000 miles from Virginia Beach in the US to Bilbao, Spain, and will have the highest capacity among all subsea cables crossing the Atlantic. According to the companies’ joint statement, the new cable will help lower their costs while increasing bandwidth rates, and would ensure they are ready for the increasing data demands of the world. The companies refuse to disclose the costs of the project, but Alan Mauldin, research director for the market analysis firm TeleGeography, says trans-Atlantic cables usually do not go below $200 million. The cable should be finished by October next year.